Update: Over a year and a half since Olaplex first filed its lawsuit against L'Oréal for allegedly knocking off the maleic acid-based formula to create its own Smartbond treatment, the English High Court ruled yesterday that L'Oréal's product does indeed infringe upon a patent licensed by the California-based startup. The victory means that there will now be a separate hearing for a judge to decide whether to grant an injunction against future sales of L'Oréal's product, Olaplex's lawyers, Hogan Lovells, said in an emailed statement published in part by the Financial Times. L'Oréal said that it strongly disagreed with the decision, and will be applying for permission to appeal in U.K. High Court. The plot, like your hair post-bond-repairing treatment, thickens. This story was originally published on 26th November 2016. It’s a truth universally acknowledged – at least in the world of hair – that we always want what we don’t have. Born with poker-straight locks? You’ll crave curls. Blessed with a full head of luscious, bouncing ringlets? You’ll envy your sleek-haired sisters. That said, I’m pretty sure no one would want what the genetic lottery gave me; mousy in colour, puffy and untameable in texture, my hair is the very definition of ‘meh’. First came the ghds (which Noughties teen didn’t have a poker-straight phase?). Then came the highlights. Chunky and stripy at first, courtesy of my local hairdresser (with pictures of Cher in the window), and then elegant and expensive-looking when I graduated to a ‘proper’ salon. Finally, along came Rosie Huntington-Whiteley and her effortless bedroom hair. Those undone curls were the final nail in the coffin of my hair's health as I succumbed to the power of tongs. Add up eight years plus of heat styling and bleach, and what do you get? Some ratty-looking hair, that’s what. Of course, I’ve tried everything. I’ve doused my hair in argan oil, slept in silk turbans, tried every leave-in conditioner on the market and paid princely sums for salon-only nourishing treatments that, truthfully, just made it look a bit greasy. I had pretty much accepted that mine was the kind of hair that only looks good from a distance. Until the summer of 2015, that is, when I discovered Olaplex. Launched to global fanfare, Olaplex was the brainchild of two American chemists and had the seal of approval of colourist-to-the-stars, Tracey Cunningham. 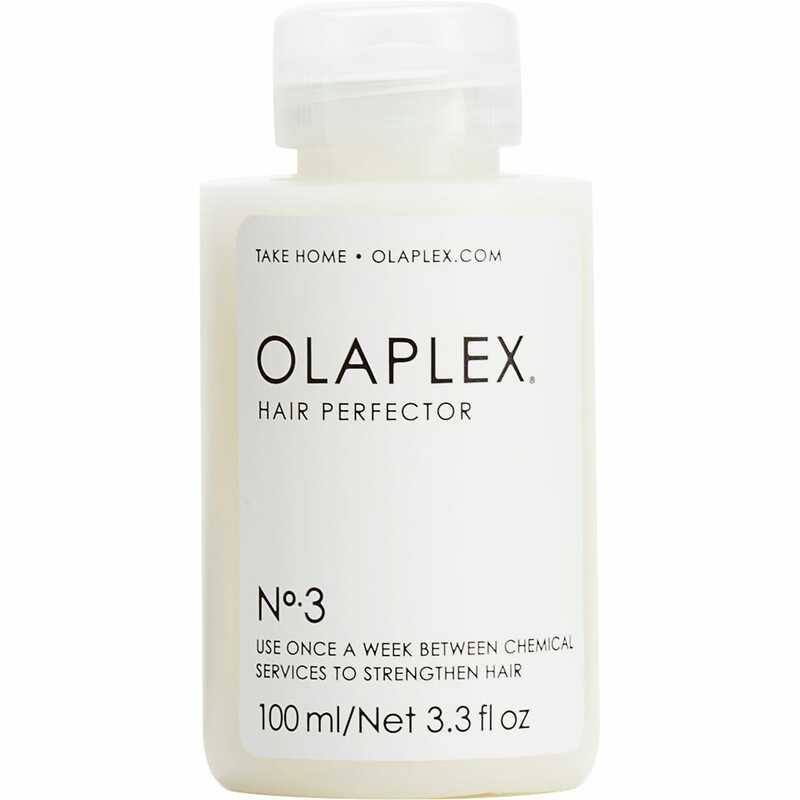 Unlike other salon-only treatments that add a superficial layer of hydration to the hair, Olaplex claimed actually to repair the damage caused by colouring and styling. A quick science lesson here: when you use a bleaching agent, it oxidises the melanin in your hair to make it lighter, and just like oxidation isn’t good for your skin, it’s not great for your hair, either. This process breaks down the disulphide bonds in your hair and leads to breakage, split ends and dull colour. Heat styling does a similar thing. Essentially, the more you mess with your hair, the more you’ll break these bonds. Until now, nothing’s been able to repair them. Which is why Olaplex is so groundbreaking, Vanessa Boland, Olaplex’s Education Manager proudly explains: "Olaplex works by finding single sulphur hydrogen bonds and cross-linking them back together to form disulphide bonds. There’s nothing else on the market that can do this." And what’s more – perhaps more excitingly for salon staff – its reparative properties allow colourists to undertake more extreme colour transformations in less time. If you’ve ever sat in the salon while someone has a ‘colour correction’ (or suffered the indignity yourself), you’ll know that lifting, say, a murky grey tone to a brilliant blonde can take several sessions. Not with Olaplex. Using it while colouring the hair not only repairs past damage but also acts as insurance against future grievances. Hell, Kim Kardashian West said the only thing that rescued her hair from her two-week dalliance with platinum blonde was rigorous use of Olaplex. With eight patents pending worldwide, Olaplex’s three-step system (two in-salon applications, one at home) seemed untouchable. I tried Olaplex for the first time at my aforementioned 'proper' – and now, favourite – salon, FOUR London, and the results were remarkable. I was used to seeing my hair snap when I ran my fingers through it, picking whole handfuls out of my hairbrush every day and having enough split ends to warrant a three-inch trim whenever I went to the hairdresser. Olaplex changed all that. Fast-forward 12 months or so and a new ‘Something-bond’ or ‘Something-plex’ seems to hit the market every day. But can any of these copycat products stand up to the original? Probably the most intimidating competitor for Olaplex is Smartbond, the L’Oréal Professionnel-designed system. Olaplex is now in fact suing L'Oreal over Smartbond, claiming that they riffed their technology. According to the Wall Street Journal, L'Oréal saw a patent application and marketing strategy from Olaplex when they expressed an interest in buying them (which fell through) and then later down the line, Smartbond was born. "After receiving that confidential information L'Oréal ceased pursuing the acquisition of Olaplex, and instead wilfully took and copied Olaplex's technology without authorisation to create three slavish 'me too' knockoffs," Olaplex claimed. L'Oréal refute the claims and plan to fight tooth and nail in court but legalities aside, how do the two match up? Just like Olaplex, Smartbond is a three-step process, with two steps applied at the backwash and one given to the customer to take home. Besides having the backing of their in-house science squad (they are literally printing human skin in their labs, guys), L’Oréal have an incredibly well-established network of salons across the globe, meaning it’s less of a risk for a L’Oréal Professionnel salon to take on Smartbond. Since the product is designed to work with L’Oréal’s salon-only hair colours, should anything go wrong, they’d be covered by their insurance – and the salon can rest assured that the dye and the treatment will work hand-in-hand. "The key ingredient in Smartbond is maleic acid," L’Oréal’s Senior Scientific Advisor, Atoshi George explains. "It acts like a mopper-up of bleaching agents and helps some of the weaker bonds to reform." Smartbond also contains a patented blend of ceramides and polymers, which have to be fine-tuned to give optimum results: "Even one percent difference in the balance of polymers and ceramides can throw the whole formula off," Atoshi warns. "It’s a very fine line between creating something that will nourish the hair and something that’ll make it look greasy." "Smartbond is like insurance for the hair. It protects the bonds from breakage in the first place, and the maleic acid helps some of the weaker bonds to repair themselves. That being said, we don’t have any concrete numbers that prove it can actually reform the bonds themselves", Atoshi says. Unlike Olaplex, it can’t magically sew those bonds back together but, as Atoshi reminded me, prevention is often better than a cure, regular trims and treatment products like Shu Uemura's overnight serum will keep your locks in good health . No matter how well-reformed those bonds are, they’ll never be like new. And at the end of the day, it’s about how your hair looks and feels – you could have countless bonds repaired and still feel like your hair is a bit lacklustre. I tried Smartbond at Percy & Reed West End and was pleased with the results; my hair looked healthy and bouncy, although I felt I was seeing a bit more shedding than I did with Olaplex. So if your hair is in need of some serious TLC, I’d still advise Olaplex – nothing else on the market right now offers the same rehabilitative function. For truly abused hair, some salons will offer a series of Olaplex treatments without any colour, to get your hair ready to be dyed again. If you've pledged allegiance to a colourist at a Smartbond-only salon, don’t panic. It all comes down to your primary concern. If your hair is doing okay and your colourist raves about Smartbond, no problem. You’ll be protecting your hair from future damage, and the ceramides and polymers will undoubtedly improve the look and feel of your mane, if not indefinitely. If you’re considering a drastic colour transformation, or if you’ve really damaged your hair over the years, it has to be Olaplex. Now, if anyone needs me, I’ll be begging my colourist to take me Kate Bosworth-blonde. Surely it’s safe now, right?